It’s hard to imagine now, as we plan a four-month road trip across Canada to write a travelogue/guidebook starring our dog Zolo, but when we first got him he wanted nothing to do with me and I wasn’t even sure I wanted him. My wife Alexis was wanting a dog for a while. But my cat Jake was getting old and I wasn’t keen to upset his life. I’d carried him home cradled inside my jacket when he was just a handful of weeks old. After 14 years together, Jake was too big a part of my life to disrupt his routines that much. Alexis was willing to wait but that didn’t keep her from searching Petfinder.com for dogs described as “shy” and “quiet” so that if I changed my mind, Jake wouldn’t feel threatened. It was a smart tack to take. Weeks of looking at those pictures worked magic on me. Pretty soon I was dreaming of having two sweet animals cuddled on the couch with me. Zolo on his first night living with us. 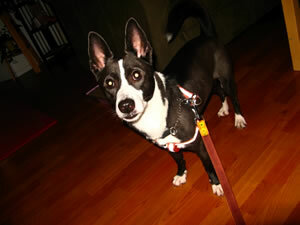 When Alexis first saw the picture of Zolo on Petfinder he was pretty hard to resist. Big, round dark eyes and tall pointy ears coupled with black and white coloring just like Jake’s drew us both in. That he was rescued on the streets of Taiwan and was a world traveler like Alexis and me, piqued my curiosity further. I was convinced to take a trip across Puget Sound to meet him because he required a quiet household. When we got to The Big Dog Project, we walked into a house filled with animals of varying sizes and types. Happily for me, these included a few cats. After the uproar that greeted our arrival died down, Zolo was ushered out of his crate and we sat on the couch chatting and giving him a chance to check us both out. It was immediately obvious that my dreams of cuddling up with him and Jake would not be realized any time soon. Although he completely ignored the cats winding around under his nose, he wouldn’t let my hand get close to him if a woman wasn’t petting him first. As a rescue from Taiwan, we were told he was likely used to being chased by the men there who apparently like to torment the country’s street dogs. A panel from our webcomic about Zolo. The importance of this fact was not clear to his first family in the States. Brought home by them because they were not able to get pregnant, he was surrendered after only a month because he was meant to be the husband’s companion; a plan Zolo would never agree to. We spent about an hour sitting with Zolo and taking him for a walk while being interviewed by the woman running the rescue. It was probably pretty obvious to her that, if she approved of us, there was no way we could leave without the little guy. Alexis’ heart had melted and I was obviously ready to try. Those first few days couldn’t have gone more smoothly. Jake was none too pleased, though he was tolerant once it was clear he could still rule the roost with an iron paw. Meanwhile Zolo who’d come to us already crate trained, was oblivious to both Jake and me. He spent most of his time in his crate or running to be near Alexis. After about 6 weeks with us, he started to let me in a bit. I remember the first time that happened. It was on our before-bedtime walk the night of my birthday party that year. He was so obviously happy to be away from the crowd and with just me. I knew we’d finally formed a bond. I still had to have a lot of patience over the next couple of years to really build his trust. But since Jake passed last year, it’s not crazy to imagine us spending almost six months driving across a continent together. And I still have one sweet black and white pet who will cuddle with me on the couch. Charles Redell is a writer in Seattle. 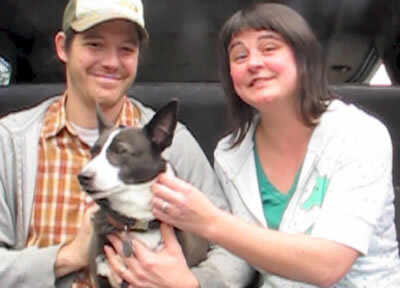 Along with his wife and dog he’s planning to create a multimedia e-book about their trip across Canada this summer (http://zoloneurotico.com). They’re raising funds on Kickstarter (http://kck.st/10tu9tP) to help pay for the research. They hope you’ll support them with a donation in exchange for one of their great rewards. Imagine yourself in our situation. The wife goes through two thyroid surgeries and cancer diagnosis. After being home from the hospital for just one week, your beloved 5 year old dog dies. This was our sad circumstance in the fall of 2012. Having lost our treasured pet Maggie to sudden sickness and death, we were both devastated. Life was a struggle. Oh how we missed our early morning puppy play before going off to work. There was no longer a loyal companion to greet us when we entered our home. No longer a best friend to play fetch, find the hidden squeaky squirrel, sit up, roll over and to give praise with a treat. Our routine dog walking workout came to an abrupt halt. Our tail wagging puppy had filled our home with smiles and laughter. Our happy feelings were replaced with grief, a strange emptiness and a great big hole in our hearts. Together we soon decided that we needed to look for another dog as our home was not the same without a canine companion.